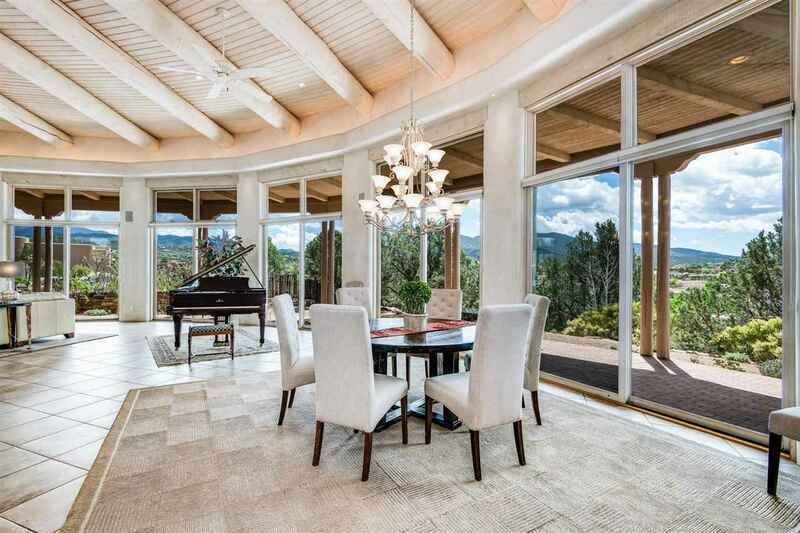 This elegant custom home is situated on a 1-acre lot with incredible Sangre views and is conveniently located off Hyde Park Road just minutes from downtown. The home features hand troweled plaster walls, imported tile flooring, soaring ceilings with vigas, three fireplaces, a rooftop deck, radiant heat and central air conditioning throughout, lighted nichos and custom lighting. The tremendous great room/dining/kitchen areas flow seamlessly together flanked on the east by a curved wall of floor-to-ceiling windows which leads onto the expansive covered portal. A magnificent kitchen sports top-of-the-line appliances and beautiful granite counters. The master suite includes a fireplace and private patio as well as a luxurious master bath that encompasses a full bathroom, shared shower and a half bath. Two additional guest suites open to beautifully landscaped outdoor areas. A generously sized office could also be a perfect media room or 4th bedroom. Also included is a guest casita with a living room, 1 bedroom, currently used as a media/video gaming room, a Â¾ bath, and space to add kitchen amenities as allowed. Guest house has radiant heat and AC. Solar panels provide 85-90% of the electric needs of house and guest house. Directions To Property: Hyde Park Rd To Estancia Primera South. Turn Right Immediately On Los Altos. House Is On The Corner - First On The Left.